It is so true that we eat for the weather. Now that we are officially into the spring season, my mind is ready for chopped salads and tacos, wanting to welcome take-out fish and chips and margaritas by the pier. But the forseeable forecast says rain, so my heart says potatoes. And when us Seattleites are put to the test, forced to live amongst the elements, the least we can do is get through it with soul-nourishing meals. Luckily Sarah Adler, the Queen-Anne based nutritionist, food blogger and owner of lifestyle company Simply Real Health, knows about cooking for us Pacific Northwesterners -- she grew up here herself. 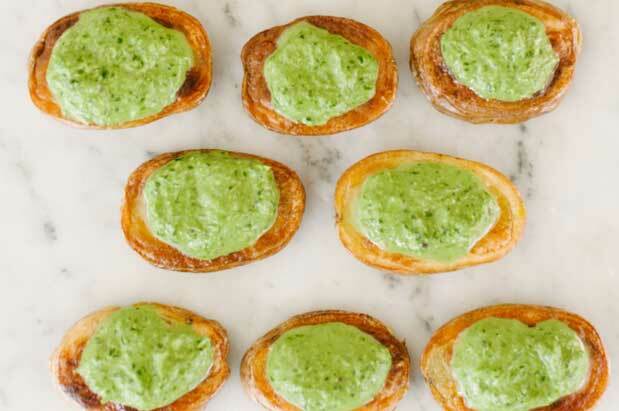 And while her new cookbook is bright and charming, filled with a variety of warm-weather bites you'll be racing to nosh on out on the patio this summer, today we're embracing the clouds and keeping it simple -- roasted potato bites with chive-parsley tapenade. Whip these up for a rainy day snack, and use the leftover tapanade as a marinade for your meat, fish or veggies throughout the rest of the week. If you want to meet Adler or purchase her new cookbook at one of her book launch parties, head here to check out dates coming up in your area. Add all ingredients (except potatoes) to a blender with a splash or two of water. Blend until smooth, then transfer to a small ziplock plastic bag. Add potato halves and toss with olive oil. Sprinkle with sea salt and pepper. Bake for 30-35 minutes until brown, flipping halfway inbetween. Remove from heat and squeeze tapanade on top of each potato to serve.